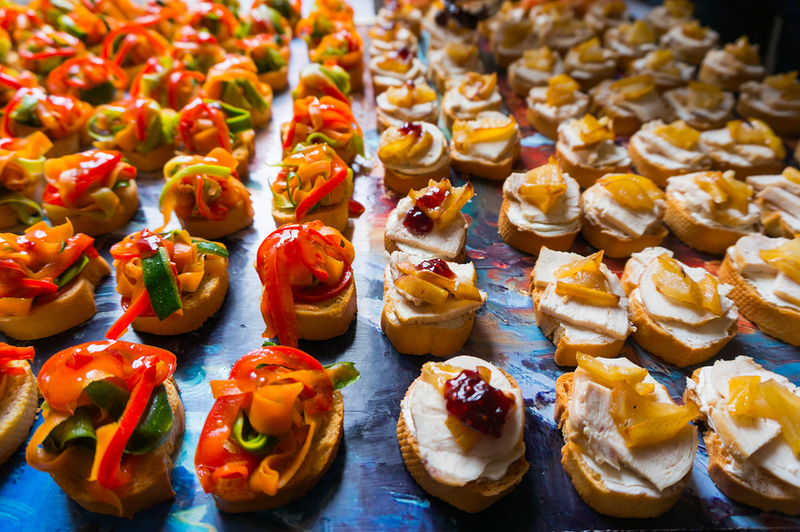 Today, many couples are balking at the traditional banquet hall catering fare (“Your choice of chicken, beef, or fish…”) and opting for more creative ways to feed their wedding reception guests. To help make your wedding-day feast one of the most talked-about aspects of your celebration, Hollywood Banquet Hall has selected a few of our Los Angeles wedding venue’s most popular catering trends. Before you finalize your menu, check out these cool new foodie ideas guaranteed to impress your guests. Champagne fountains, fondue bars, and tables filled with confections have become a staple of modern-day weddings, and many of last year’s receptions featured at least one unique station for guests to sample before, during, or after dinner. Cocktail stations, which provide guests with a choice of spirits, mixers, fruit, bitters, and a seasoned mixologist on hand to give advice, have also started becoming more popular. Passed-tray appetizers are common for cocktails hours and ideal for keeping guests’ appetites at bay, of course, but many progressive couples are taking the idea of small plates to a whole new level. A new culinary trend sees all menu items coming in tiny portions and being circulated continuously throughout the party; this allows for a greater range of dishes to be served and encourages socializing (instead of traditional dinners that limit guests to only one table and, at most, 11 other attendees, many of whom might be strangers). Wedding cakes are so 2005! Instead of opulent, towing cakes that can cost as much as $5,000, trendy couples are electing to serve smaller, bite-sized desserts like cake pops, cupcakes, cookies, or a combination of all three! Pairing your choice of sweets with an espresso bar is a great way to give your guests options and finish off your meal with a caffeine kick! These days, both men and women alike have taken an interest in mixology, and one-of-a-kind cocktails are dominating the wedding scene. To present guests with multiple options and to reflect the bride and groom’s unique tastes and personalities, many couples are hiring professional bartenders to create “His and Her” signature drinks – typically, the man’s drink is stiffer and made with whiskey or gin, while the woman’s drink is sweeter and made with vodka or rum. Giving your cocktails creative names (i.e. “Christinarita” or “Kent Julep”) is the perfect way to make each drink truly your own.